Station de One Condos - 8 A Oceanfront 8ème étage 3 chambres, unité penthouse 2 salles de bain avec sans doute les «meilleures vues de l'île depuis chaque chambre"! La cuisine rénovée ouvre sur une salle à manger et salon joliment meublé qui donne sur votre balcon privé donnant sur l'océan Atlantique. Vivez des moments tranquilles regardant vers la mer de la baie vitrée de la salle à manger. La chambre principale et la part de la chambre arrière d'un balcon couvert donnant sur le son, parfait pour profiter des couchers de soleil! Il y a une laveuse et une sécheuse dans l'unité de votre commodité. Station One offre de beaux terrains, un service de sécurité 24h / 24, un ascenseur, un accès à la plage privée, une piscine, des courts de tennis, des barbecues au gaz et des tables de pique-nique pour les repas en plein air. De plus l'emplacement est génial! Il est juste à quelques pas du centre-ville Wrightsville Beach avec ses restaurants, épicerie et magasins. Ne manquez pas d'avoir les meilleures vacances jamais! Deux places de stationnement dans le lot côté rue. Occupation: 6. Interdiction de fumer. Pas d'animaux de compagnie. Le complexe de la station One exige que tous les véhicules affichent un laissez-passer de stationnement émis par HOA lorsqu'ils sont garés sur le terrain afin d'éviter toute citation. Les laissez-passer sont strictement appliqués et limités à deux par unité de location; aucune exception ne peut être faite. Toutes les réservations nécessitent des cartes de stationnement qui seront émises par le bureau de la réception de la station 1 au titulaire de la réservation au moment de l’enregistrement. Overall: Nice condo layout. Great Location. I would rent again, but it could be improved. Cons: A lot of small, breakable knick-knacks throughout the condo, so be mindful of that if you are bringing small children. The living room recliner shown in the photos does not recline or rock. There are signs of past water leaks around all windows facing the ocean. When it rains, water leaks around the balcony doors into the condo below, Raju, so the maintenance team will have to enter this condo to work on stopping the leaks. From looking at the ceiling in the lower apartment, this appears to be a recurring issue. The master bed is very firm. Pros: The views could not be better. The kitchen is large with an open layout, which makes it easy for large families to gather and prepare meals. The condo is very quiet. I would recommend this condo. The Condo was very roomy and the view was awesome. Several things disturbed our vacation though. In my opinion, there should have been more towels available. The furniture needs to be updated and at least match. So many different random pieces. The kitchen facet kept flying off. We had no hot water for showers the first couple days. The twin beds WERE NOTcomfortable at all. We bought a blow up mattress. TOO MANY entrances required keys!!! Kenny, We are glad to hear that this condo was spacious and that you enjoyed the views! We apologize that you the provided linens we not sufficient for your needs. You can order additional towels sets via our rental contract; on future stays please let us know and we will be happy to help you arrange additional linens for your stay. We were unable to locate any reports of the issues you noted above during your stay. Had we been made aware we would have gladly had our staff address the faucet and hot water. Our maintenance technicians are available to guests 24/7 to assist with issues that may arise. We will investigate the items you have mentioned and greatly appreciate your feedback! 5 moms who desperately needed a vacation had a wonderful time at this condo. The floor plan was great, location was perfect and views of the beach divine! The blue chair in the window overlooking Wrightsville was my favorite spot to sit. Hopefully we will come back next year! This likely is one of the best properties on Wrightsville Beach as far as location and views of Wrightsville Beach are concerned. The interior is a little dated, but very well maintained and does not take away at all from the experience of your stay. 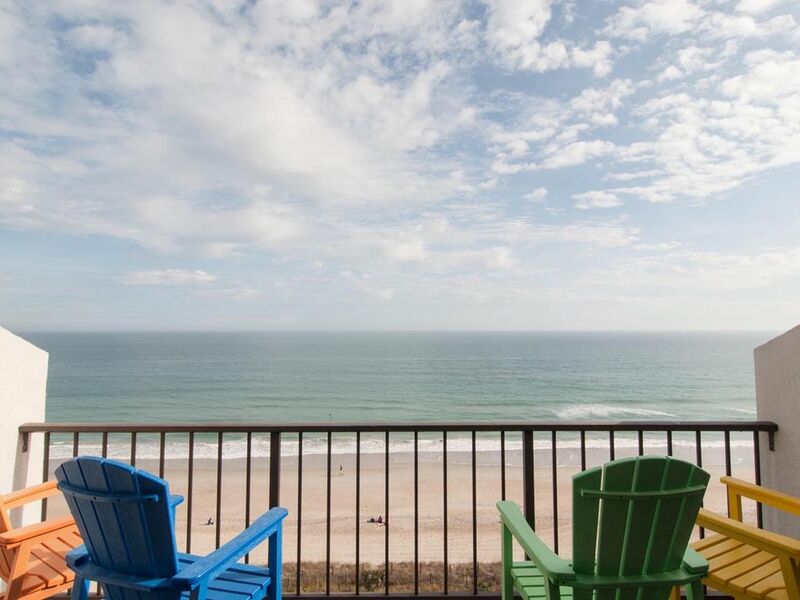 Whether sitting on the beach-side deck or reading a book on one of the bedroom decks, this condo is perfect for our family of 4 (and up to 6). An easy walk (less than 2 minutes) to nearby shops, food and bars combined with a secure access facility makes Allensworth the perfect getaway. Oh, and don't forget the lounger settled in the bump-out by the living area. Great spot for a mid-day nap with 180 degree view of beach, north Wrightsville and Banks Channel. Would stay here again in a heartbeat!